It is easier to change the position. It is footpeg bar kit that correspond to TRIUMPH standard footpeg. It is possible to change the position at the exercise station with a radius of 15mm around the standard position.The position can be selected from 12 places, and the right and left positioning is also easy. Please choose the desired position according to the body shape and preference. 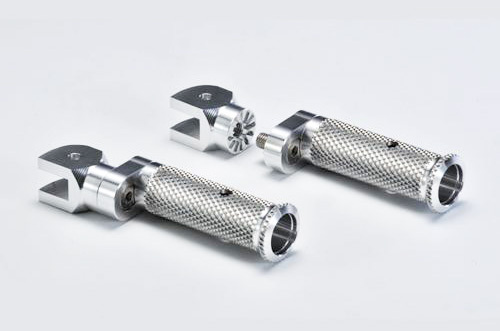 The footpeg bar is knurled finished with excellent grip. It does not use the pin is in the positioning, by sticking to processing cut-out, and it is made with a smart and high-texture structure. The footpeg bar that is mounted as standard is a round type that does not change the stepping feeling at any angle, but it also supports the new type cut footpeg bar.